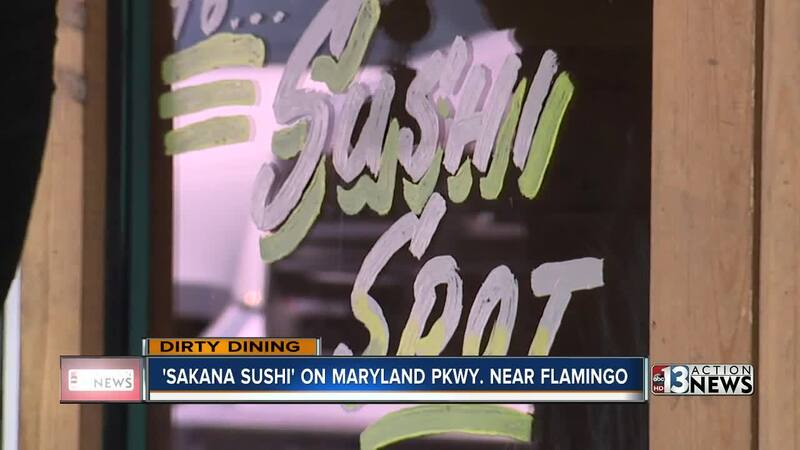 All-you-can-eat sushi restaurant Sakana on Maryland Parkway near Flamingo was downgraded to a C on July 31. The next day, they failed re-inspection and were shut down for repeat violations and the imminent health hazard of inadequate refrigeration. Sakana's only walk-in cooler was holding everything at an unsafe temperature, including crab, cream cheese and raw beef that had turned brown. All of it had to be thrown out. Inspectors also documented black mold in the ice machine chute, caulking around the sink soiled with black slime and floors dirty with old food debris. Orville Johnson, the person in charge, said "We are not interested in interviews. However, we have no excuse for the grade that we have received." Sakana reopened August 2 with a 5-demerit A grade. They're now in the Health District's administrative process and must complete intervention training. Dirt Dog at Bally's Grand Bazaar shops on Las Vegas Blvd. was shut down August 2 for lack of adequate refrigeration. Inspectors found cooked corn that was labeled at nearly a month old, water from the fridge condenser was dripping into batter, there was grease build-up on floors, dirty cutting boards, a fridge soiled with food debris and greasy utensils stored as clean. Dirt Dog reopened the next day with a 3-demerit A grade. The owners say excessive heat caused equipment failure and it was a bad moment for them but they got everything quickly fixed. They say the food that was out of temperature had just been delivered and they were working to bring it into the safe temperature zone. As for the corn, they say the label was expired, not the product, but they still chose to throw it out. They say the grease problem was due to the malfunctioning exhaust fan and they were already awaiting repair technicians when health inspectors arrived. Dirt Dog's owners want to stress that their violations were not due to negligence, just equipment failure that was out of their control. Pachuca Hidalgo catering is a six-time Dirty Dining repeat offender. Their number two food truck was shut down July 30 for three imminent health hazards: inadequate refrigeration, inadequate employee handwashing facilities and a cockroach infestation. They were back to a zero-demerit A on August 3 but still have to attend intervention training with the Health District. In addition to unsafe food temperatures, inspectors saw numerous house flies landing on packaged foods and food contact surfaces, and numerous cockroaches crawling throughout the truck on food containers and equipment. No one from Pachuca Hidalgo returned our call for comment. Kids Turf Academy on Silverado Ranch and Maryland Parkway had its kitchen shut down for a multi-generational cockroach infestation on August 1. Inspectors found four different sizes of German roaches they noted were "Out during daylight, walking around and not scurrying away." The kitchen reopened August 3 with a zero-demerit A. Kids Turf Academy Director Connie Harris said they were unaware of the roaches because the bugs were confined to an unused dishwasher which they've since removed. She said after the inspection they had multiple pest control treatments in the following two days and did a full carpet cleaning. And finally, Steak N Shake on St. Rose Parkway in Henderson was shut down July 31 for sewage. A back-up inside the facility was coming out the entrance. There were also flies in the seating area. Steak N Shake re-opened the next day with a zero-demerit A grade. Franchise Owner Travis Carl said the new building had plumbing issues and they notified the landlord immediately when they first opened. He said when they ran the water in the restaurant, it contributed to a back-up in the sewer line which they had no authority to repair. He said it took the Health District's action to force the landlord to fix the problem.